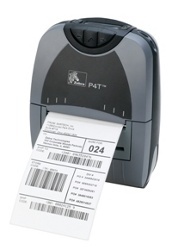 The easy-to-carry P4T printer enables you to print long-life bar code labels and documents up to 4 inches wide where and when you need them resulting in enhanced data and asset-tracking accuracy and improved workforce efficiency. Uniquely flexible, the P4T offers the advantages of thermal transfer image durability (bar codes/text/graphics), optional RFID, advanced wireless connectivity options and included direct thermal mode in a versatile variety of combinations. When paired with tested genuine Zebra thermal transfer supplies, the P4T printer produces 2 to 4 inch wide labels or other documents that withstand harsh environments and offer archival longevity ranging from 18 months to up to 10 years in outdoor applications. The P4T has been discontinued and is no longer available for sale. View ALL Mobile Printers for other options or give us a call at 1-877-640-4152.